My inbox has been flooded with emails from various publicists touting "modern and elegant" Thanksgiving table settings....but I was neither inspired or impressed with any of them. So I enlisted help from interior designer and friend Kyle Schuneman to create a beautiful and fresh Thanksgiving table setting. 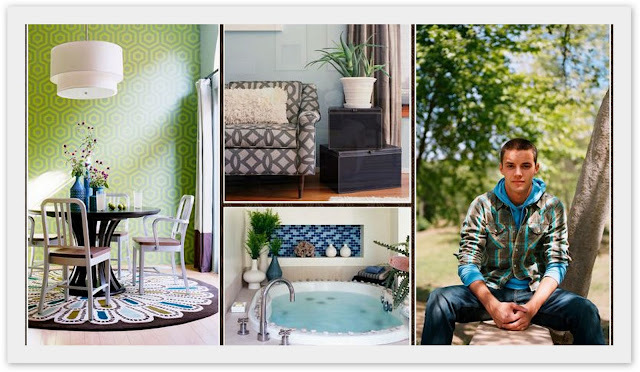 Yup, this uber-talented designer (who just so happened to be dubbed one of the "Next Wave of Top 20 Designers" in House Beautiful) created a custom design for Triple Max Tons readers....enjoy, get inspired, and I would love to see pics if you recreate this spectacular look! I think that Thanksgiving should be a table full of natural elements that feel casual and elegant. I love doing a lot of chunky wood blocks at different heights with cream candles to create a really special table. An arrangement of dried orange proteas in the center would create a focal point without blocking the conversation flow and natural linen and burlap runners and napkins would be a great textured touch. I like combining napkin rings and place card holders in one to keep it from feeling too formal and I love the idea of using cut twigs with everyone's handwritten names on them as the name card - I think these easy personalized touches make your guests feel welcome. For the dishware, the handmade feel is a big trend now so I love using these shaped plates and bowls in whites, creams and naturals. Having worked with multiple chefs on shows and photo shoots I have learned that food looks best on whites and creams so let the food be the star! Aren't these tips fab? I am loving the Protea suggestion, and the dishes he selected are just perfect. I am sure the glow when all the candles are lit would make for an intimate and unforgettable setting. Genius. For more inspiration, go check out Kyle's website....lots of interior goodness over there, and follow him on Twitter for the latest steals and deals! 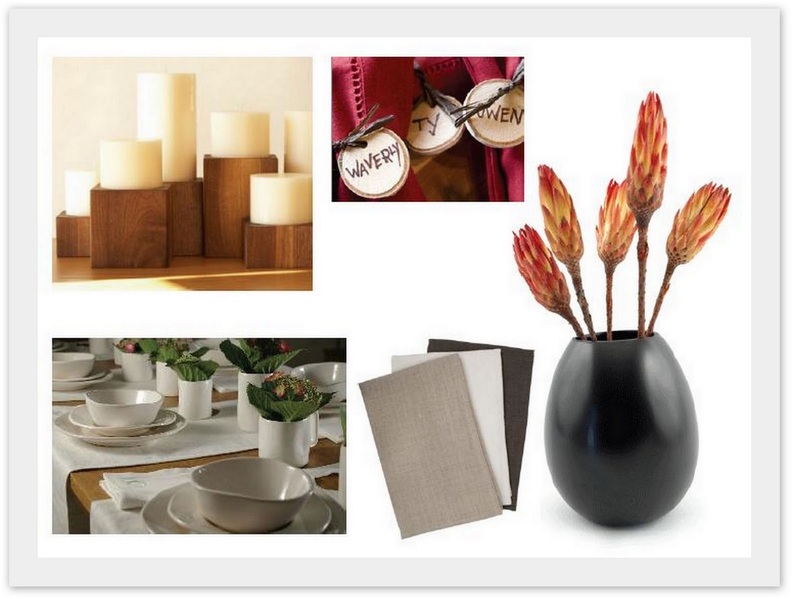 A big thanks to Kyle for putting together this gorgeous inspiration for a Thanksgiving table setting! I love these ideas. Maybe I will try to recreate some of it considering this is exactly my style modern, elegant, clean lines with lots of wood elements. i love the wooden candles holders, so lovely! I really like the bowls on the table, they're casual but they still look nice because the look like they could be hand made. Very pretty and fresh. you should do them too! that last one got posted on my facebook and a guy friend of mine commented.. it was strange but good i guess! hi, was browsing & found yr blog. I really like it - very clean layout & feel. love the look of those candle holders. thanks for the inspiration! These styles are fresh and clean with a zinger of great style. Thanks for sharing. Inspired to create a great table now. so wow! what a clean and modern look and so special that it was personally designed for you. i adore getting inspired by such wonderfullness, thank you! i was given the opportunity to acknowledge some of my favorite new blogs and have included yours in a post today! hope this meets with your approval, i just adore your writing, pics and all, it's lovely being able to tip my hat to you in this way. looks particularly relaxing..i think that Thanksgiving is so emotionally charged with many expectations about the 'right' food..its nice to be at a table with a relaxed feel. I did see a really cool idea today for all of you (like me) who would get so obsessed with the menu that you would forget the place setting until the last minute: use food. Place red apples in tall glass vases. Put whole cranberries in vases and top with a lit votive. Gather some greenery from the great outdoors and lay on an elongated silver platter and garnish with apples and/ or cranberries and squash, etc. I thought this was beautiful, and used what was already at your fingertips. Love how simple the Thanksgiving setting is, it's perfect! If only I could decorate like that! Casual / elegant is the perfect combination. Beautiful post!